I was lucky enough to live on Tortola, BVI for a little over a year. We chose this place because of the great surf in absolute paradise surroundings. The 8-mile stretch from Smuggler’s Cove to Cane Garden Bay is the best place I have ever been and Apple Bay is right in the heart of it. A sweet A-frame provides peeling waves, lots of palm and banana trees, and tropical islands in the distance form the backdrop. There’s a weird beach bar, friendly locals, amazing chicken, green hillsides and turquoise waters. Yes, please!! When I was a teenager I bought surf magazines every month, dreaming about surfing in these amazing spots all around the world. 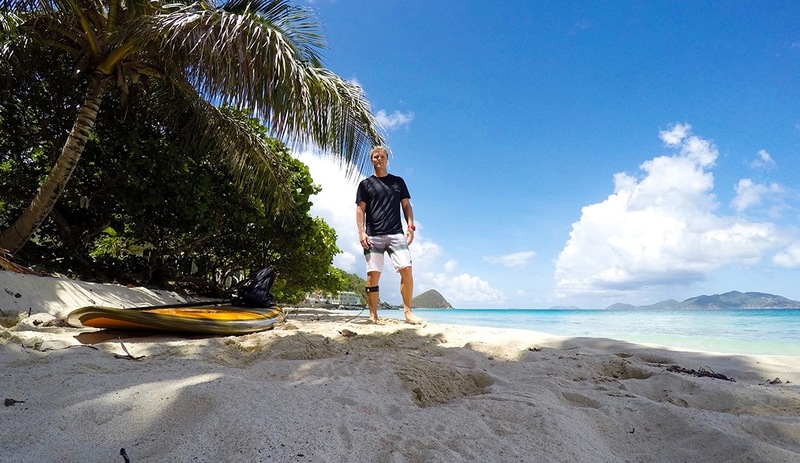 Ever since, I have been visiting quite a few of these famous surf spots, mostly in the Caribbean. Strange thing is, you would expect these surf spots to attract thousands of tourists, hotel chains, bars, restaurants etc. But, it is the complete opposite! 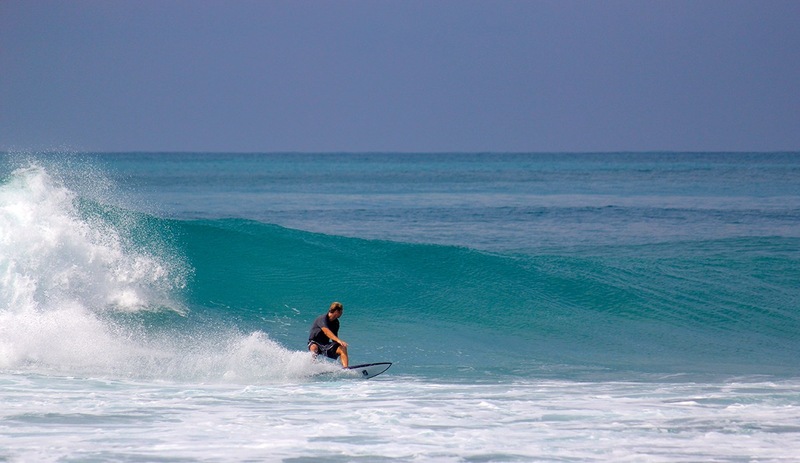 Most famous Caribbean surf spots we visit are off the beaten path, usually right in the middle of farm country. It’s funny, but I think you can seriously find cows with a 1-mile radius of the some of the best waves of your life. Apple Bay is no different. 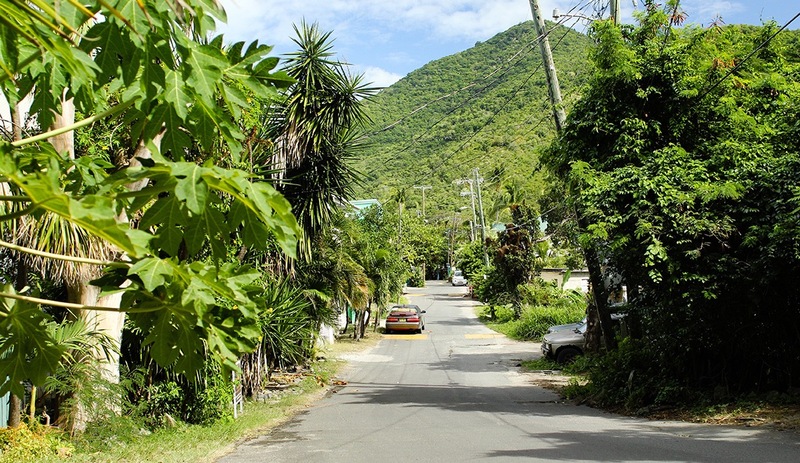 Cute little town, right in the ‘countryside’ of Tortola, about 25 minutes from Road Town, and yes, we have seen cows having a blast ON the beach. Of course, all those surf magazines take their photos on the best days, with the bluest skies, the best swells, and offshore winds. Apple Bay usually delivers waves during the ‘Caribbean winter’ from October through April. 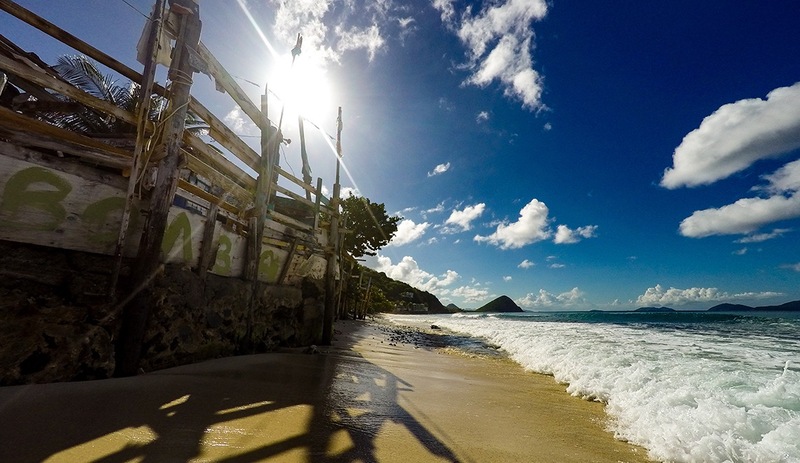 The Tortola North shore is facing the Atlantic and gets hit by most big swells from winter storms. Apple Bay is a place that needs those swell. So it can get flat and it is tricky to find the best times to travel. If you have the patience, wait for a swell to pop up and jump on a plane. For most of the other days, wax up your longboard. Every year is different but during the time I was there I got about 6-8 solid swells, which usually lasted for 4-5 days. I have seen Apple range from knee high to double overhead, usually with offshore to side shore winds. It can get crowded when a big swell hits as people flock from all over but mostly surfers rushing in by boat from USVI. When the waves are good, don’t expect too many locals, they are off to secret spots all along the cost or at Cane Garden Bay. Crowds are not a problem as they usually stick to the ‘right’, leaving a great left alone. When the swells angle and size is right, there is also a right called ‘Bomba Little Pipe’. Don’t expect big barrels, as I think the place got its name from the actual pipes on the bottom of the reef. Not sure what they are for. And not to worry when it gets real crowded. Just find your own surf break somewhere else along the road, like the rock at Long Bay or Donkey spot and Schoolyards in Carrot Bay. For me, the absolute best days came when it was shoulder to head high and light winds. The water is clear, the waves are absolute beauties and most surfers will think it is too small. There have been several days when I had Apple all to myself, having an absolute blast. When you drive down from Zion Hill and you reach the t-crossing, you have reached Sebastian’s. It’s a small scale hotel, not investing in modernism, not cheap, but it definitely has its charm. Usually, the only place to sit on the beach when the waves are coming in. The hotel is popular amongst surfers as the main surf break is only 100 meters away. Don’t expect all these hip youngster surfers. Because of the hotel price (and the price tag to even get to the BVI), you will generally see older couples having a relaxed and great old time. There are several other options for accommodation in Apple Bay. The beach houses next to Sebastian’s are great (check out Casa Caribe!). There are several vacation rentals in the hills and even some apartments for rent a short walk from the beach. In the end, it doesn’t matter where you stay, you will be on the beach all day anyway. Having an accommodation right next to the beach and ocean is super great. But beware that 6 months of the year the waves are up. This means a lot of noise. It’s not for everybody so prepare. Bring earplugs and most important: just enjoy the sounds of the crashing waves and the feeling of waking up and jumping in the water. Ow, almost forgot… the sunsets… Buy a beach chair on you first day, a small cooler for a couple of beers and a bottle of white wine, mosquito repellent, nestle yourself right near the water line: camera, lights, action!! Pro tip: Sebastian’s has a little shop at their front desk where you can get cold beers at a lower price than in their own bar. And you don’t have to wait for it. If there is one common food denominator in all the different Caribbean islands, it is the chicken. Different varieties, of course, but all chicken: jerk chicken, chicken roti, arroz morro con pollo, galiña smor. On Tortola, they take it one step further. No stray dogs, but a lot, really, a lot of stray chicken! Chicken on the street, in the garden, on your porch, chicken everywhere. Having so many chickens around must be inspiring the cooks because oh my, the chicken! Grilled to perfection. It doesn’t matter if you go the little restaurants or buy it on the street at one of the food stands. It is not cheap for a piece of chicken, but well worth it. What can you say about this weird and funky little beach bar? I always thought it was ugly and by far not the best beach shack I have been to. But, it is an icon. It is a must stop for cruise tourists and those beer bellied grandpas with pulled up white socks let their cameras burst out hundreds of snapshots. I always feel good when tourists take a lot of photos at your local hangout. This means that you are living in their potential ultimate vacation postcard. Bomba Shack is known for its famous full moon parties, but they are not that great. Bomba’s is a place where you play beach bar games, feet in the sand, watch the surfers, flirt with the Dominican señorita behind the bar, do the limbo, get eaten alive by sandflies, write weird texts with a marker anywhere you can and get out of your head drunk. And you will do all that. Why? Because you can’t resist ordering a cocktail, and the bar lady can’t resist putting way too much alcohol in it, and then you won’t be able to resist ordering another one, and another one. Lights out! Guaranteed! This is kind of a weird part of Apple Bay. Driving up to the t-section you will often see people hanging around. Everybody knows that you can get some decent marihuana and mushrooms there, but nobody is allowed to say it. Although everybody knows, you still have to be secretive. Even a blind man can see a drug deal is going on, but still you can’t show any money when handing it over so you have to go ‘low-five’ style. Anyway, just ask around if you want some, people are friendly. The product is not the best in the world, but rolling and smoking one under the stars on a white sandy beach with the lights of Jost van Dyke in the background; can’t get much better. Something that won’t help you as a traveler but is an important part of soaking in local life in Apple Bay. In the middle of town, you will find a school and sports fields. At night, those fields are empty and open to you and your friends to play sports. As it usually gets dark before 7 they have big lights, which you can turn on via an old fuse box next to the field. Perfect temperatures, safe environment, friendly locals who often want to play with you, lit up hillsides around you. Just playing sport, like you are a small kid again, not worrying about anything. Me, I like to play basketball. Often I would have the court all to myself or kids would join me for a pickup game. On the grass field next to it, often there would often be expats playing rugby. I will never forget the feeling coming over the hilltops driving down to Apple. The butterflies in my stomach, anticipating the waves to be ridden and the incredible views to be seen. At the end of one of my first surf sessions at Apple, I was paddling in and had to duck dive for a wave. Right then, in the wave, I saw the two ‘house reef’ turtles swimming, as if they were welcoming me. I have seen them many times since. During one of my last sessions, one turtle came up right next to my board and hung around for a little while, as if he knew I was leaving again. Goodby turtle, hopefully, we get to ride together again someday! Very nice blog Sebas! Good to see you again! Great post! Really enjoyed your writing and pictures!